Situated beside the iconic LA Memorial Coliseum is the state-of-the-art Banc of California Stadium. It’s a juxtaposition of old & new, Roman & renowned, football & futbol. Banc of California Stadium is a cloth napkin in a nacho cheese world. 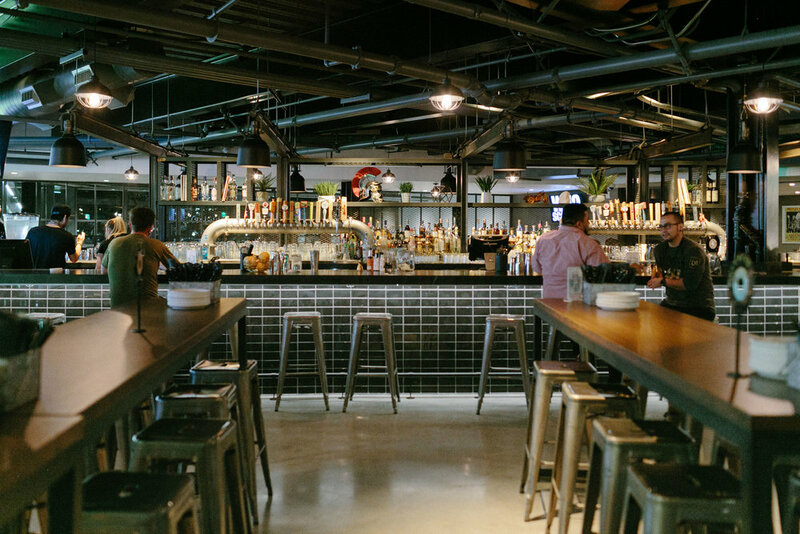 Within this stadium is The Fields LA, a fast-casual dining hall featuring fare by award-winning chefs, and within this hall is Free Play, an elevated sports bar complete with arcade games, craft cocktails, and shareable plates. It has all the makings of a classic sports experience without the scent of stale beer and sticky surfaces. The muscle behind Free Play’s menu is Chef Tim Hollingsworth, an alumnus of The French Laundry and head chef and owner of Otium. He’s classically trained in French cuisine and passionately fond of french fries, making it obvious in his hearty menu featuring American bar food that both please the palate and soak up spirits. Entrees range from a humble Double Cheeseburger oozing with melted cheddar and thousand island dressing to roasted Harissa Chicken bathing in its own garlicky juices and North African spices, to a Taco Salad stuffed in a hard shell that’s as big as Shaq’s size 22 shoe. For those who are on a break with beef, opt for the vegan Mushroom Sandwich with lightly fried Hen of the Woods mushrooms, tofu cream and arugula. It’s delicate, delectable and has the potential to convince any pitmaster that veganism is not a sin. 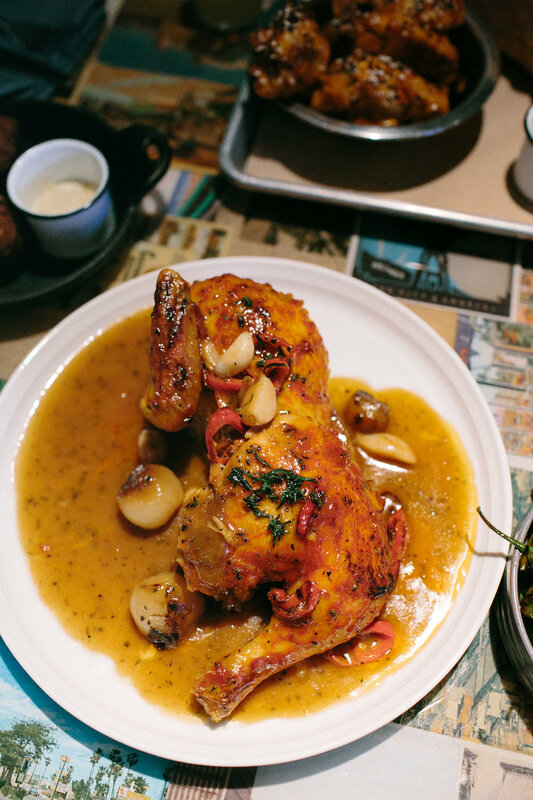 The menu is meant to be shared and picked at while it triggers feelings of nostalgia, comfort and guilt. It’s everything you want to feel with a chicken wing in one hand and a Macho Man Shandy Savage in another. A bar without a bar program is just a shelf. Thankfully Free Play has a vibrant mix of cocktails, shooters, shandies, beer, and wine harmonized by bartenders Julian Cox and Nick Meyer, brewer James Mhaoir, and sommelier Andrew Pettingell. The Macho Man Shandy Savage is just as intriguing as its name implies featuring mezcal, chipotle, peach, beer and a Slim Jim. It’s smoky, savory and elegantly symbolizes chest hair and gas station pickups. But if you want something fruitier and slightly dangerous, get the Miami Vice shooter with coconut rum, strawberry and lime. It’s sweet like a Jolly Rancher and stings like a shot. For the purists, the beer and wine list include a few local DTLA brewers like Boomtown and Mumford, plus wines from regions close to home and across the globe. Whether you have tickets to see an LAFC match or catching a game on one of the many TVs, Free Play is open to everyone who wants to eat, drink and be rowdy. 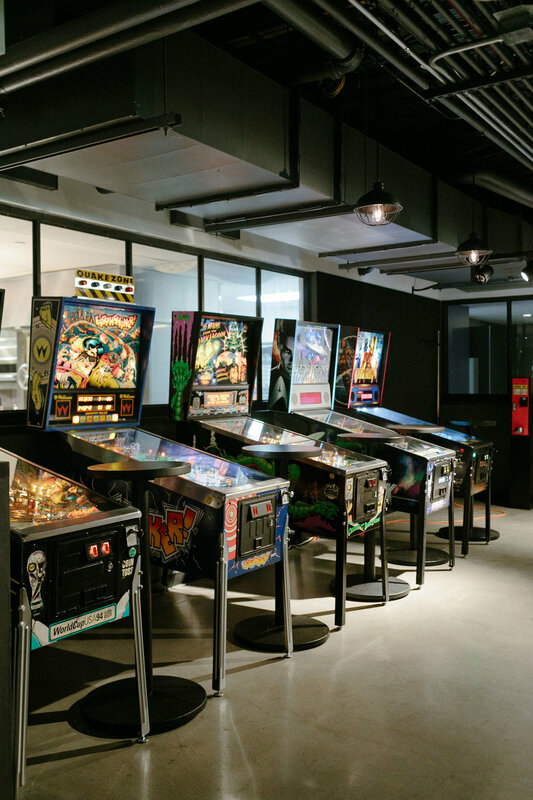 Take your drink and spare change to the arcade area with pinball machines, foosball and a pool table or head into the mid-century man cave. There are pockets of places to post up within the 70-seat bar and 120 person dining area—it’s just enough for your friends, family and Instagram followers. Cheers.